HIGH QUALITY, PROFESSIONAL ASPHALT AND CONCRETE PAVING SERVICES SINCE 1958. Since 1958, Pacific Paving prides itself on operating as a Quality and Service Oriented Business. Our commitment is to provide professional quality service and workmanship with competitive prices. Schedule an appointment today. We will review your request in detail and provide the best solution for you. All work performed comes with a standard 5 year workmanship & materials warranty from date of completion. Power steering marks and tire marks (tire marks from hot weather) are not covered under our guarantee. Is your Asphalt Cracked or Damaged? No matter what type of paving or paving repair work you require, Pacific Paving has the expertise necessary to deliver the quality job that you deserve. We are your premiere source for Asphalt Paving and Repairs in the Toronto and Mississauga. Pacific Paving has been the paving company of choice for asphalt paving in Toronto and Mississauga for 60 years. No matter what the size of your project, our team of paving experts has the knowledge and experience necessary to ensure your driveway, parking lot, laneway or other paving project is done right the first time. 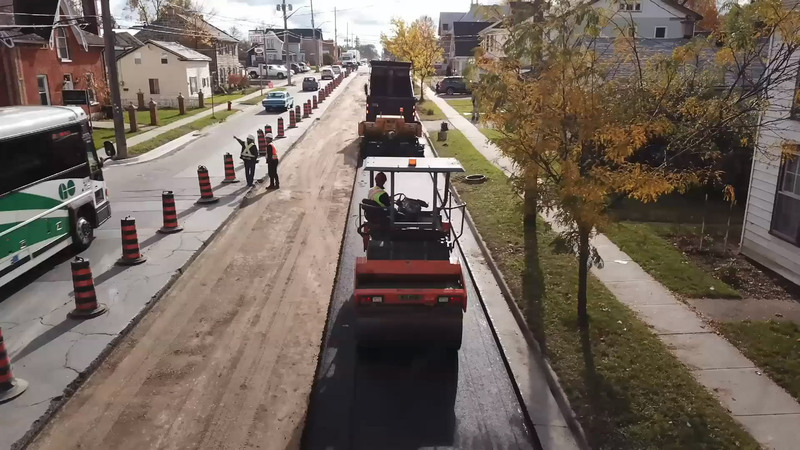 We offer top quality residential, industrial, and commercial asphalt paving throughout the GTA and we would be pleased to speak with you about your project. Commercial Paving at its Best! While there are many companies that offer paving services, commercial property owners need to work with pavers that specialize in commercial paving in Toronto and Mississauga. Since commercial jobs generally require more manpower and more specialized equipment, this is not a job that you can trust to just anyone. At Pacific Paving, we have all the necessary equipment for your commercial job including pavers, rollers and excavation machinery. Whether you wish to put down new asphalt for an extensive project such as a parking lot for a development complex, or whether you have a smaller project in mind such as resurfacing, adding extensions to existing lots, or installation of speed bumps, we are committed to providing a quality job for lasting results. Pacific Paving is proud to serve our community by proving the finest professional concrete work in Toronto. With over 53 years of experience in the industry, our team is committed to providing the highest quality of concrete works on the market while keeping the client’s interest at heart. The number one type of repair we do involves patching surfaces. Due to weather and usage, potholes will eventually form on your surface. That is a fact. Asphalt patching for Toronto properties is especially important as salt used to keep the surface safe during the winter accelerates the problem. For professional quality asphalt grinding and asphalt repair services in Toronto, Pacific Paving has got you covered. Asphalt cracks are common in all forms of asphalt applications, from driveways to parking lots, and can be caused by a multitude of factors. In addition to our many other services, Pacific Paving also specializes in professional demolition for Toronto properties. With over 53 years of experience in the industry, Pacific Paving has what it takes when it comes to assisting our clients with their demolition and structure removal needs. Pacific Paving is pleased to provide professional quality site excavation in Toronto and the GTA. Through digging, grading, tunneling and trenching, Pacific Paving will prepare sites accordingly to the needs of the client, optimizing it for further procedures such as concrete or asphalt application. For those in need of professional quality water and sewer maintenance in Toronto, Pacific Paving has the knowledge, expertise and know–how to address any type of common water and sewer maintenance issue. If your surface is beyond the point of general repair and in need of more serious attention, Pacific Paving can do a complete repaving. Asphalt grading can bring back the driving surface to functional condition, and restore the drainage attributes of roads or other surfaces. Pacific Paving is excited to provide our clients with high quality, professional landscape construction for Toronto properties. With over 53 years of experience, our team is prepared in the many aspects of landscape construction, enabling us to approach each project with the utmost attention to detail. For professional winter snow services in Toronto, look no further than Pacific Paving. In addition to our paving and landscape construction services, Pacific Paving also offers professional snow clearing services such as snow plowing, snow removal and salting for our clients.